When you want to get a big group of friends or family together at home, one of the best options is a cookout. The men showing off their grilling and cooking skills, while the women are arranging the tables and chatting away heartily, is a wonderful sight. When you plan to host a cookout or just want some private family time at your backyard, the first requirement is a good gas grill. The gas grill is what determines the quality of your rendezvous. Great company and good stories can be ruined by bad food. When you and your friends are gathered to eat some tasty steaks, a bad grill can mess up the entire plan. Not only will it not cook your meat properly, it may even give you trouble and ruin the entire mind set of all involved. When you invite people for a steak party and they end up eating takeouts from the nearest restaurant, no one is going to accept your next invitation again. There are a number of brands offering a number of gas grills with various features and specifications. Choosing what suits you best, is definitely not a joke. Char-Broil is one such company that has a number of gas grills to suit you varied needs. 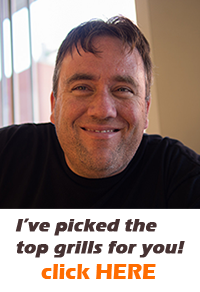 Here is a char broil review to help you make the right choice. It is not just a gas grill, but a gas grill with four burners that will enable you to cook more for the same amount of time spent in front of the grill. The 480 square inch cooking area is big enough to let you cook for a large crowd. When you open up the 180 square inch, swing away warming rack, you get more space. Now, that is just what you need to keep all those steaks warm enough for your big crowd to enjoy your cooking to the fullest. This char broil review will assess the features, advantages and disadvantages of the product, aiming to provide you more clarity and information to help you choose the perfect grill for your needs. The gas grill has 4 grills. When the number of grills is more, the cleaning process takes more time and is definitely complicated. However, this Char-Broil grill has grates coated in porcelain. This coating, not only makes the grates more durable, but also holds better insulation and is very easy to clean. This coating ensures the food does not stick to the grills. All you have to do is, get some soapy water and use it to wipe down the grills with a sponge. All the 4 burners are made of stainless steel. Stainless steel gets heated up fast and can hot for a longer period of time even after the burner is turned off. These burners are made to last long and can provide a cooking power up to 40,000 BTU. Now you can grill those steaks much faster and join your gang at the table earlier than before. When it is cooking outdoors, the biggest limitation is the space. When you are in your kitchen, you have the counter to spread all the food across and you can have a microwave by the side to reheat the food. When you are outdoors, you have just the grill to do it all and your food cools down faster. The Char-Broil classic 4 burner gas grill has a large cooking area of 660 square inches. While 480 square inch is the primary cooking area, the remaining 180 square inch is the warming rack. This rack is coated with porcelain, thus making it long lasting and easy to clean. When you are outdoors, lighting a match to ignite the stove can be a big challenge that is not only time consuming, but also tests your patience. Where is the fun if you are frustrated right in the beginning? This gas grill is equipped with an electronic igniter, where all you have to do is just push the button and you grill is ignited, just like that! When you want to move the grill around, either to avoid catching the wind or just to place it in a better position, you don’t have to lug it around. The gas grill has two large wheels which make it easy to move it around. In addition to the 480 square inch or main cooking area, you have the side burner. This burner can be used to keep your sauces and side dishes warm, while the main dish is getting grilled. You can’t serve a cold side dish and a piping hot main dish. That just ruins the taste. This side grill can produce 10,000 BTU of power. If you are done using the side grill or don’t have the need for it, just flip down the lid. Now you have additional working space to cook in comfort and peace. If you are a regular cook or grill frequently, you know the importance of maintaining the temperature for the food being cooked. Different styles of cooking and different meats have different temperature requirements. Gone are the days when you had to stick a food thermometer into the meats and monitor the temperature. This gas grill has a temperature gauge that is very conveniently located. Now you can keep track of the grill’s pre- heat status and also maintain the desired temperature inside the grill while cooking. The control panel, lid, handle and the fascia are all made of stainless steel. This ensures long durability of the grill, as stainless steel does not only get rusted, but is also easy to clean and maintain. Stainless steel is also light and malleable, thus resulting in a light weight grill that can easily moved around. This finish renders style to the entire grill. You not only have an efficient grill but also one that commands at least one appreciative glance. Though this gas grill is loaded with amazing features, there are some disadvantages too. Though very low maintenance and easy to clean, this can sometimes prove to be a challenge. When you are cooking your meat “rare”, it tends to stick to the grills. Though you can use some soapy water and wash down the grills, getting rid of what is stuck and grilled on the grills is difficult. If the grills were made of stainless steel, you can use a wire brush or something hard to chip off the gunk. You cannot use such hard items to clean a porcelain grill. Porcelain grills require higher maintenance too. Care needs to be taken that the porcelain coating doesn’t chip off while cleaning and cooking. Though the grill comes with two huge wheels to aid easy portability, these wheels are made of plastic. The grill is not heavy; hence plastic can take the weight. However, how long it can last when used frequently, is not very clear. The side burner, which can double up as extra working space does not have the electric igniter like rest of the grill. Now this beats the entire “need no matches” rule. If you decide to use the extra cooking space, you need to fiddle around with the matches. The electric igniter that comes for the main grill does not last very long. When used very frequently, the igniter tends to stop lighting up every time, like with any electrical item that is used frequently. The porcelain coated grates require extra attention while cleaning as they are not as easy the stainless steel, to clean. However, these grates start rusting much earlier than you would like. 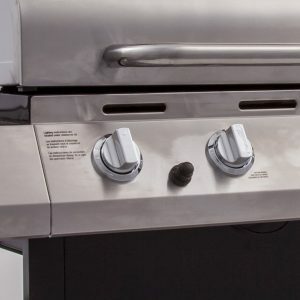 When there are grills that have complicated parts, which require different sizes of screw drivers to fix parts in place, this gas grill makes it very easy. All you need is one screw driver and some patience. You can assemble this grill single-handedly and don’t require any expertise in this area. The temperature gauge is located at the right place. You can take a peek at the temperature as and when you are cooking, instead of bending and looking for it. While many grills require you to carry your own thermometer to check the temperature of the grill, this gas grill from Char-Broil does not give you that trouble. While most of the gas grills in the market offers similar cooking space or lesser, the make shift extra cooking space is a major attraction, according to the char broil review. When you want additional cooking space, you can just open the lid and cook away. You can serve your guests not only hot grilled steaks, but can also serve warm sauce. For a 4 burner gas grill, the Char-Broil is cheaper than most of its competitors in the market. Most of the other grills that offer similar feature are priced at least twice as much. When you are replacing your old grill sooner than expected, or have a low budget for your outdoor cooking, this grill can be the best choice. You get lot of features at a low cost. This Char Broil gas grill offers one of the highest BTU among its peers. Higher the BTU, higher is the heat energy produced to cook your food. With high heat, you can cook more varieties than just burgers. When you cook fish or other delicacies, you require varied heat levels and this grill enables you to cook as per your choice. While many of the competitors are offering only 3 burners, the Char – Broil offers 4 burners. When you have more number of burners producing more heat, your grill gets heated up fast and is ready for cooking, much faster than the other grills. Now you don’t have to waste your precious time, waiting around for the grill to heat up to the required level. Grilling is a major part of every household with a backyard. No backyard landscaping is complete without a designated spot for the grill. Though one considers the cost and size of the grill, before investing, there are many more factors to be considered. This char broil review aims to give you an insight into the Char-Broil Classic 4 Burner Gas grill, so that you are well educated about the product. When you are armed with enough knowledge, it makes it easier for you to choose the best grill for your needs. Always remember to consider your needs and requirements first, before you go out hunting for the perfect grill. Just because one grill suits your neighbour, doesn’t mean it will be right for you too. More than the style of cooking, the comfort level of the person cooking is also very essential. If one prefers the charcoal grill due to its even heating and the smell produced, they cannot be satisfied with any of the new age gas or propylene grills. Always check reviews like the char broil review, before you finalise on your purchase. It always helps to get feedback from other users, before you invest your hard earned money into a random grill. Users are not always biased and each one can point out a different positive or negative point with the grill. All products tend to develop problems only after a few uses, and it is precisely for this reason why a review should be perused before you go out and buy yourself a grill. The Char-Broil Classic 4 Burner Gas Grill is unique and has many features that surpass its competition. Invest in this grill and enjoy your backyard gatherings and cookouts like never before.